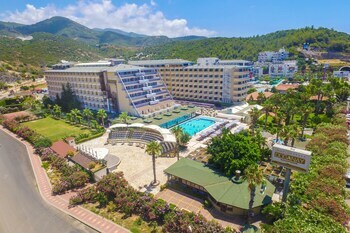 With a stay at Beach Club Doğanay - All Inclusive in Alanya, you'll be by the sea, within a 15-minute drive of Alanya Aquapark and Ulus Beach. Featured amenities include a computer station, dry cleaning/laundry services, and a 24-hour front desk. Planning an event in Alanya? This resort has 21520 square feet (1999 square meters) of space consisting of conference space and meeting rooms. Free self parking is available onsite. With a stay at Lygos Hotel in Antalya (Lara), you'll be a 4-minute drive from Lara Beach and 9 minutes from Butterfly Park Antalya. Free valet parking is available onsite.